NASA's Solar Dynamics Observatory snapped this view of the sun fading into shadow as it slips behind the Earth from the spacecraft's vantage point on March 29, 2011. The image was taken during SDO's so-called eclipse season, when it flies behind Earth for up to 72 minutes of each day. 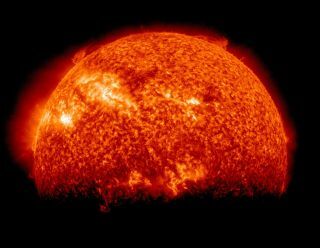 A powerful NASA solar observatory has snapped an amazing view of the sun, a photo that shows the star partially obscured by the Earth. Sometimes, as the spacecraft swings behind the Earth, the probe is able to catch views of the planet as it blocks the sun. The result is an eerie view in which the sun's bright disk gradually fades from view. "Earth's shadow has a variegated edge due to its atmosphere, which blocks the sun light to different degrees depending on its density," NASA scientists explained in a photo description. "Also, light from brighter spots on the sun may make it through, which is why some solar features extend low into Earth's shadow." NASA's Solar Dynamics Observatory experiences two eclipses seasons every year. The observatory was launched last year and is equipped with several high-definition cameras to beam back stunning views of the sun in different wavelengths. The $850 million solar observatory is expected to last five years.